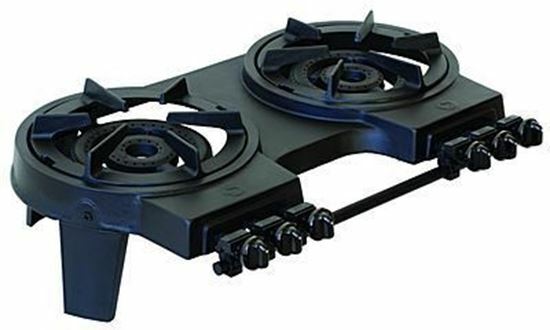 Double burner portable cast iron stove, 63-5200. The Model 63-5200 is the two burner version of our popular 63-5100 and provides twice the cooking area. It can handle those tough jobs because of its heavy wall cast construction. It has been designed with portability in mind. Big enough and tough enough to handle the most demanding activities. The 63-5200 is drive by two 35,000 BTU burners. Available in propane and natural gas.